GW have released previews of the next release for Warhammer: the Gloomspite Gitz. Look at those dice. I'm not a dice person generally. I don't care what color or size (within reason) my dice are or what material they are but those are just cool. The new fanatics are cool, but fanatics are always cool. I'm not tempted enough to dive in on a Goblin army yet, as I'm starting a Daughters of Khaine army if I'm started a new anything army, but these look fun. Plus plastic squig and squig hoppers. I may buy the endless spells just for the cauldron on spider legs. I love me some gobbos! They've been in the "cartoon-like" genre of models since 8th edition IMHO. The gobbos certainly are. And I think they work like that. The empire stuff was going that way too. However the new chaos, karadron overlords and definitely the daughters of Khaine are not particularly cartoony at all. The DoK are about the best fantasy female figs on the market right now. There's not a lot here I don't already have, but I might get fanatics at some point to update the models I have. The old plastic fanatics were OK, not great. These look a lot better. Of course price is going to be an issue too (I would have to replace at least 12 in my army). As for the other models, it depends entirely about how compatible they are with previous editions of Warhammer, as I don't play AoS. 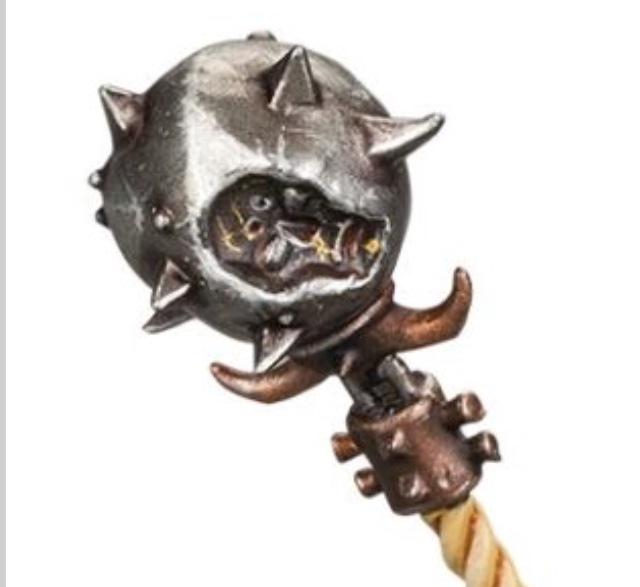 Imprint of Stormcast face on Fanatic weapon. I'm not sure why any of the models would not be compatible with previous editions of the game. Or any fantasy model at all for that matter. Looks like an amazing new range of models! That mushroom cloud spell is just way too cool..especially since it's made to appear as an actual – mushroom! These models look fantastic. I had wanted to get some squigs and what-not just to paint, now I just have to. Those dice are horrible looking. Plus I already have 15 Fanatics and over 400+ Goblins. My oldest son is into squigs, and I think he is going to like all these. Good thing he has a job! I like the dice. I think these show they still have a sense of humor. I have trouble seeing the details on the trolls. (I know they're troggoths now.) Maybe too much going on. I picked up the Squig Herd and Squig Hoppers boxed sets, and also the Loonshrine terrain piece. It's a fantastic range of miniatures. These latest versions of their classic squigs I think are the best they've ever done. The way they design the sprues and the way they fit the parts into them are amazing. Mold lines are often hidden by the way the parts go together and where there are mold lines they are very subtle and minimal. I got the dice and they bouncey and great. Just fun to roll.